Wilmington, Delaware-based peer-to-peer bitcoin marketplace Paxful announced in a press release sent to CoinReport that it has launched a new widget that, like the bitcoin technology company’s website, makes it possible for anyone the world over to instantly buy bitcoin with more than 300 ways to pay. Since it is a widget, anyone can have their own customized bitcoin kiosk also. All a user is required to do is embed the widget within their blog, website, mobile app, YouTube channel, Facebook page or email subscriber list, earning up to a 2% commission from every sale made. 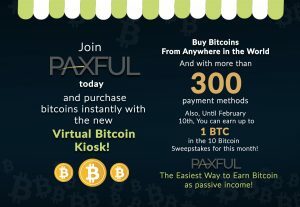 On the occasion of the Virtual Bitcoin Kiosk’s launch, Paxful is giving away 10 bitcoins to those who sign up and make at least one sale before February 10 in a sweepstakes. “We have spent a year and a half learning the game inside and out and factoring in every little place where a first time buyer can get stuck and giving them a way to finish. This thing just works. There is also a pretty darn neat Silver Lining for the entrepreneurial folks,” said Paxful co-founder Ray Youssef in the release. Based on their preferred purchasing currency (gift cards, debit cards etc. ), quantity of bitcoin needed and chosen payment method, buyers are instantly connected with sellers from around the globe. This three-step process is what makes Paxful so easy to use, said the release, adding, getting bitcoin has never been simpler. There are unique link codes, buttons and banners that anyone can use in order to participate and benefit from the Paxful Virtual Bitcoin Kiosk. “Bitcoin is still an early stage technology. Think about how the web was before Google AdSense. This program is incredible for anyone seeking ground-floor opportunities,” said Youssef in the release we received.